This week’s parasha continues a theme we saw in last week’s parasha, Vayetze, which began and ended with the mentioning of angels. So too our parasha continues in the same venue. In ancient times, there were no chapter and verse breaks within the text. 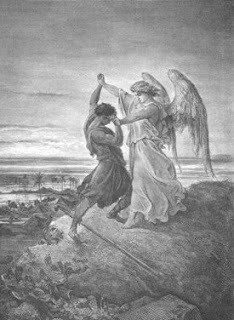 The previous parasha ends with Jacob being met by angels, leading him to call the place Machanayim – referring to the encampment of G-d. Immediately this week’s parasha begins with the next verse (Gen. 32:4), with the words vayishlach Ya’akov malachim … and Ya’akov sent forth messengers ahead of him. Since the word malachim can mean both human messengers and angles, the rabbis understand this verse to refer to the angels in the previous verse. Therefore, Ya’akov sends forth both physical and angelic messengers from the camp ahead of him to prepare for meeting his brother Esav. There is a spiritual and physical preparation. In ancient Near Eastern understanding, the crossing of a river was a symbol of new beginnings and a new start – a sort of rebirth. That is why there is a purposeful connection with the name of the river (Yabok) and the word vaye’avek – to wrestle/struggle. It was here, at the river of a new beginning in Jacob’s life that he also received a new name – and a new identity – Israel. This was a test for Jacob and a preparation for a new beginning in his life, to go from being Ya’akov to becoming Israel – the father of the twelve tribes and a great patriarch of the Jewish people. It was a physical and spiritual preparation. Although Rashi and other sages identify this mysterious figure as the angel of Esav, there are also understandings of this figure being more than just an angel. A clue to this is in the Hebrew itself. Not only does it mention that he struggles “with G-d and with man,” but his name is changed to Israel. The definition of “Israel” is to wrestle/struggle with G-d. Although you can argue that it may just be figuratively, there are two more hints. The idea of G-d taking on a physical form is not unheard of in the Torah, or in ancient Jewish understanding. Within this sort of incarnation is an obvious Messianic connection. It is not ridiculous to understand this mysterious encounter as a physical and spiritual struggle between Jacob and HaShem. Parashat Vayishlach teaches us that through wrestling with G-d, and striving for G-d’s purpose for each one of us, we will enter into a new beginning for what lies ahead. This entry was posted in Uncategorized and tagged Apologetics, Pieces of Parasha, torah, What Your Rabbi Hasn't Told You. Bookmark the permalink.